Alfonso Ribeiro stories at Techdirt. stories filed under: "alfonso ribeiro"
The Roca Labs saga continues. As you may recall, the company is suing PissedConsumer and a former customer while threatening lawsuits against many others (including us). Part of the issue is that it makes customers agree never to say anything negative about the company in exchange for a "discount." Ribeiro unequivocally is not, has never been and has no intention of ever becoming a paid spokesperson of the Product [Roca Labs]. Furthermore, Ribeiro has never personally used the Product and in no manner whatsoever endorses the Product. The unauthorized Review and deceitful use of Ribeiro's name, image, likeness and falsely attributed quotes violates California Civil Code Section 3344, invades Ribeiro's common law rights of privacy and publicity, amounts to unfair competition, is an unfair business practices, and constitutes copyright infringement, among other causes of action. As I said at the time, I'm not sure the unfair competition or copyright infringement claims would fly, but a falsely implied endorsement is exactly what publicity rights laws were designed to deal with. Pretty quickly, the page about Ribeiro disappeared from Roca's site. 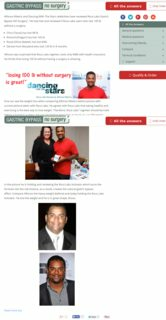 One of our readers, jonr pointed out that it appears the photos of Ribeiro actually came from a Dancing With the Stars "backstage gifting suite" in which the participants in the show are photographed with various sponsor products. Given the smackdown from Ribeiro's lawyers, you might think that Roca would be careful about still using his image in any sort of implied endorsement. And yet, Roca has put up an entire page with photographs from the event and what appears to be implied endorsements. 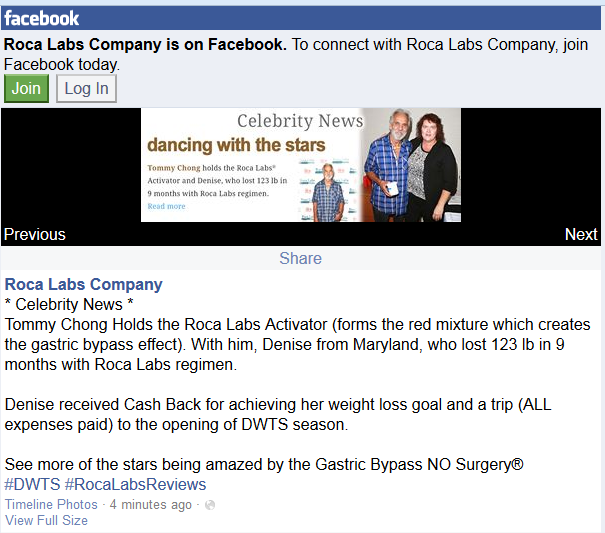 The page says "the stars are impressed with Roca Labs." And the first star at the top of the page is Ribeiro, which is interesting, given his lawyers earlier claims. There's also some photos with Tommy Chong. And just a little while ago, Roca Labs posted on Facebook what certainly looks like yet another implied endorsement from Tommy Chong. Sure, it doesn't directly say he endorses it. It just says "Tommy Chong holds the Roca Labs" products, but that would appear to imply an endorsement. I contacted Tommy Chong's manager and agent to see if this was an approved use of his image and name, given the previous issues with Ribeiro. His manager, Paris Chong, quickly informed me that, no, Tommy Chong has not signed any kind of endorsement deal with Roca Labs. It seems likely that Roca would say that it never implied any actual endorsement -- hence the claim that he's merely "holding" the product. But using an image like that in a manner that implies endorsement to your average reader might face difficulty under various publicity rights laws that, again, are specifically designed for situations exactly like this one. On September 22, 2014 I purchased a promoted review on pissedconsumer.com for a monthly fee of $5.99 (See Exhibit C attached). I placed an approved statement by television celebrity Alfonso Riberio [sic] who is currently a contestant on Dancing with the Stars about Roca Labs. On September 22, 2014 I received a notice from Pissedconsumer.com that my review was canceled.... I received no explanation of why it was canceled. Roca Labs is using this as a (rather weak) attempt to argue that PissedConsumer is engaged in some sort of unfair practices because it (Roca claims) "will not allow positive information to come forward." This filing was quickly rejected by the court for procedural issues, focused on the failure of Roca Labs' lawyers to first confer with opposing counsel. However, before even that happened, Roca Labs filed another motion to "shorten time" for when Roca can file a motion for sanctions against PissedConsumer's lawyer, Marc Randazza. The reasoning behind the claim of sanction is not clear (it says a draft is attached, but it does not appear in PACER right now), but it seems to suggest that it's because of Randazza filing for a temporary injunction against Roca Labs threatening or suing the witnesses that have come forward on behalf of PissedConsumer and against Roca Labs. As we mentioned in our previous post, within days of PissedConsumer's legal response to Roca Labs, the company's "general counsel" had sent legal threat letters to all three former customers who had filed statements, even though Roca Labs hadn't had any dealings with two of them for over three years. It's difficult to see how anything Randazza did was sanctionable (Roca Labs' lawyers' actions, on the other hand...). Either way, Randazza has now filed a rather revealing response, opposing the motion to shorten time, noting that it fails for the same procedural issue (and more) as the earlier filing and because there's basically no chance that the sanctions succeed. It notes that the court has reviewed his motion for the injunction and passed it along to a magistrate judge, who has asked Roca Labs to respond -- something that would be unlikely if the court felt his filing was somehow frivolous. It also fails to actually cite any legal authority for shortening the length of time. Finding its bullying tactics unsuccessful, Roca filed an unsupportable complaint, along with it, an unsupportable motion for injunctive relief. Thereafter, Roca began trying to intimidate witnesses. Then, Roca got even more desperate – submitting an affidavit... that contained demonstrable perjury – that the actor Alfonso Ribeiro (“Carlton” from “The Fresh Prince of Bel Air” and current “Dancing with the Stars” contestant) endorsed the Roca product..... See Exhibit A, a demand letter from Ribeiro’s attorneys attesting to the perjurious nature of Roca’s claims that their client approved any such statement. I'm not sure that Roca Labs' usage would actually be "unfair competition" or "copyright infringement," but that might depend on other specifics. However, they make it clear that he has not and will not endorse the product, which would make this a total slam dunk publicity rights case (this is the exact type of situation that publicity rights law was designed for, even if people keep trying to stretch it). It is worth noting that the letter in question is to PissedConsumer, concerning its hosting of the review. That review -- which was up earlier this week when I saw it, has since been removed, noting the letter from Ribeiro's attorney. Much more tellingly, a page that used to be on Roca Labs' own website showing the very same endorsement from Ribeiro has also disappeared from the site, though (as of this posting) it's still viewable via Google cache. Here's a screenshot to show that it absolutely existed: There is a photo of what appears to be Ribeiro holding Roca Labs' product -- so there may be some questions raised about whether he did or did not endorse the product at some point, but his lawyers seem fairly definitive in saying he did not. The fact that Roca has removed the page from its own site also says a lot (and none of it good for Roca Labs). The desperation continued with Roca threatening personal claims against the Defendants’ attorney for statements made in the course of litigation. Also, for whatever it's worth, Berger accuses Randazza of distributing the filings to reporters, perhaps unaware that we reporters are also allowed access to PACER and can (and do!) download documents ourselves. Shocking, I know. Either way, the Roca Labs case is taking on the stench of Righthaven- and Prenda-like desperation. Given what's happened so far, I imagine there are still more interesting things to come. Update: And... just like that, the court has denied the motion to shorten time on the procedural issues around the failure to confer with opposing counsel.